I am delighted to be DJing at this event alongside Red Tin Dave. This is a White Rabbit night, the people who brought their amazing light show to our MV & EE gig. 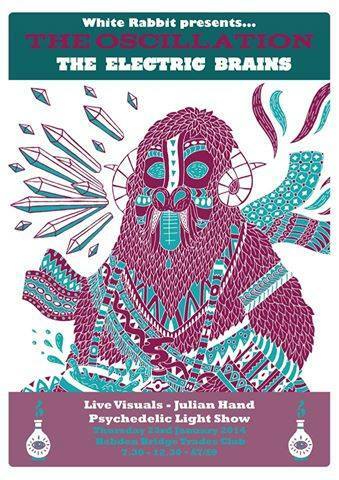 They’ll be bringing their lights along and there will also be live visuals by film maker Julian Hand. Support comes from local pop psych heroes The Electric Brains. The Oscillation was formed in London in 2006 by Demian Castellanos. This incarnation of The Oscillation was intended as an outlet for more rockier ventures alongside other projects going in different directions such as The Orichalc Phase, incorporating influences from punk funk disco, krautrock and psychedelia with danceable rhythms, repetitive angular avant guitar noises inspired by Loop, and layers of analogue synthesizers. The debut album by The Oscillation on DC Recordings, “Out Of Phase” was released on 15th October to universally good reviews. A live band was formed to coincide with the record with Tom Relleen on bass guitar, Mark Thomas on keys and Jon Abbey on drums, along with Julian Hand providing a retina destroying light show using projectors, slides and oil paints. The band continued playing numerous shows, refining their live sound and building a reputation for inventive re-interpretation of the recorded songs along the way, supporting the likes of Sliver Apples, Beak, Zombie Zombie, Disappears, Wooden Shjps, Dead Skeletons and Deerhunter. The 2nd album Veils came out in 2011, branching further out into more complex song-writing and liquid psyche instrumental passages. This was followed by the “Fall” e.p and an exclusive single for record day featuring the psyche-rock of “No Place To Go” and the opiate pop of “Waste The Day”. Around this time the live band were joined by Valentina Magaletti on drums and Chris Wackrow on keys/2nd guitar. Valentina became the mainstay on drums, both live and in the studio for the 3rd album “From Tomorrow”, recorded over 2012-13. The new album takes another step into new directions, both heavier, spacier and sonically a bona-fide trip into new realms. Released on 30th September on All Time Low and partnered with french label, Hands In The Dark. The band have been touring as a finely tuned 3 piece, with a new single a video from the album being released. You can hear musical influences ranging from The Cure, Loop, Suicide, Neu, 13th Floor Elevators, Julian Cope, MBV, Bowery Electric, Hendrix, Liquid Liquid, Stooges, Mile Davis, Silver Apples, Talk Talk, CAN & PiL. This entry was posted in other people's events, Past events and tagged 2014, Hebden Bridge, The Electric Brains, The Oscillation, Trades Club. Bookmark the permalink.